Two years ago I sat on the underground with my friend Martin and studied the tube map for places with the suffix –ham, which means farm (I’ve found activities like this make the journey go quicker!). It was clear from those place names that London’s metropolis actually grew from a large number of farms, and that a lot can be understood about history just from what we call places. I didn’t then realise that I’d come back to blog about this in relation to risk! It was just a passing comment, but one which I’ve been reflecting on for a little while. Place names reflect local history, so can toponymy tell us anything about risk? If a place has a history of repeated emergencies (lets say flooding), does that become part of its present and future through being incorporated into its name? To explore this a little I thought I’d investigate the meaning of place names on the Wikipedia UK flood list. Modern Place Name Meaning Place name is a possible Indicator of flood risk? 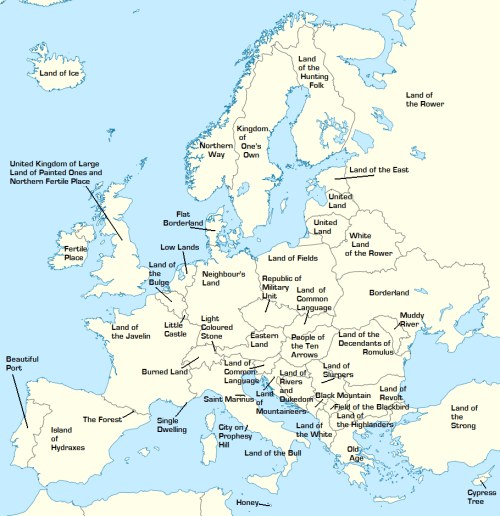 A quick Google later and I found this map via Being The Hunt, which provides the meaning of country names in Europe. At this level it doesn’t say much about risk (with the exception of Land of Revolt), but I wonder whether the same could be done for place names in the UK/London, and what hidden patterns this might reveal? The map below shows the prevalence of the surname Flood in England in 1891. What strikes me is that the surname is more common in coastal areas or those which anecdotally are prone to flooding. It’s impossible to infer much from this, but would be interesting to do a longitudinal study to see how these surname clusters have moved over time, and it’s an interesting pattern nevertheless! I’m not sure, other than being interesting, what a detailed exploration of this would reveal. 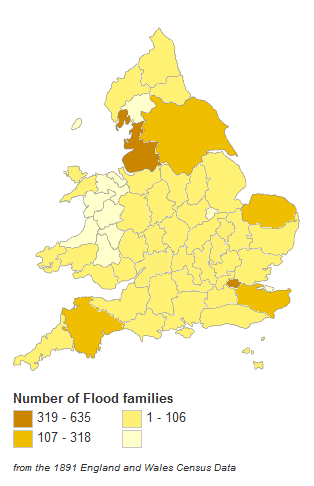 However, I’ve recently been doing some work on risk perception, and wonder whether people who live in places which have flood-related names have a higher degree of risk awareness? Your thoughts and comments would be welcomed. This is very much just a collection of half-formed ideas rolling around in my head, and if anyone could help me make sense of them that’d be great! Londonist have just released another alternative Tube map – I wonder if their next one could be ‘meanings’ of current places?